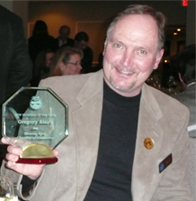 Owner, Greg Clark, accepting an award from the Blowing Rock Chamber of Commerce in February 2009 for Best New Business of the Year. Gregory Alan's is a specialty shop located in the quaint mountain town of Blowing Rock, North Carolina. Our goal is to offer a unique and out-of-the-ordinary selection of gifts and decorative accents for your home and patio. Choose from a collection of clocks, mirrors, lamps, picture frames, distinctive wall art and accent accessories in all price ranges. We are also available for home visits to offer suggestions and help coordinate home décor decisions based on our product lines. In addition, we can order a variety of products to fill special needs and supplement our regularly stocked items. We’re located in the heart of historic downtown Blowing Rock at 1179 Main Street , Unit 106, in the SouthMarke shopping court. We’re open 7 days a week during High Season (May – December) and Thursday – Monday during Low Season (January – April). Shopping appointments can be arranged on Tuesday and Wednesday during Low Season by calling or emailing the contacts below. Thanks for visiting our on-line store and we look forward to welcoming you to our shop sometime soon.